R. N. Thayer (1991-10-25). 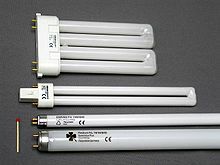 "The Fluorescent Lamp: Early U. S. Development". The Report courtesy of General Electric Company. अभिगमन तिथि 2007-03-18.